I have a strong desire to devote the rest of the articles in this series to the Wild Coast. Not enough can be said about this magical slice of South Africa. Last week we managed to tear ourselves away from Coffee Bay and head south to Bulungula, only something like 30km’s away the crow flies, but about 80km in terms of driving and almost three hours in terms of time due to the incredibly poor roads. Seriously, out here tarmac is just a distant memory and bedrock becomes the new reality. It’s tough and you need to devote time and caution to tackling it (unless you have a 4×4) but it’s oh-so worth it. We followed our rudimentary map to the tee, as Google Maps just don’t cut it out here, and only took one wrong turnoff that was quickly corrected by smiling locals. We finally arrived at the parking site, a 500m walk from the lodge, and were greeted by some young Xhosa boys who just happened to be there and wanted to help carry our luggage (which was almost bigger than they were!). Totally innocent, honest and kind, I assigned two to help “push” my wife’s bag and the third I put on top of mine and dragged him along. This was our first taste of the real magic of the Nqileni people, a people so warm and so kind that it’s difficult to believe it still exists in today’s world. We spent the next three nights here in absolute paradise. Bulungula Lodge is a community owned initiative that is run by the locals from the community nearby. The lodge is situated at the Bulungula River, where it flows gracefully into the Indian Ocean. The coast is so remote and unspoilt here that during our entire time I saw just one local man fishing from the rocks and some boys that liked to play the bongo drum and skim stones across the river. We enjoyed relaxing and unwinding locally guided activities such as sunrise pancakes, canoeing down the Xhora River and village tours. The warmth of the people that greet you, the abundance of animals and the children that wave and shout to you from their hilltop homes or while they’re herding sheep burn a hole into your heart and leave you with everlasting memories. This is the first time I was truly able to say that this land is truly Africa. 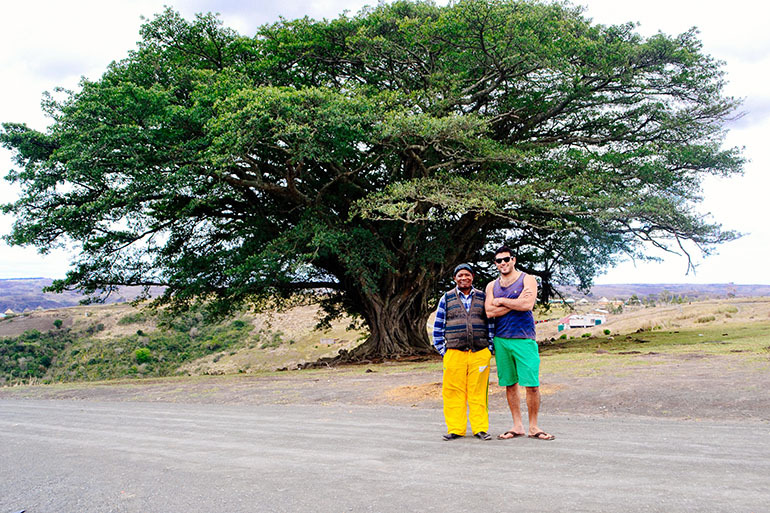 Bulungula is situated, as previously stated, on South Africa’s Wild Coast or Transkei in the Eastern Cape. From Cape Town it will take you around 15 hours to get there and from Johannesburg around 14 hours. Both are long trips and I suggest breaking them down into two days as once you get into the Eastern Cape and from the turnoff at Umtata especially, you are going to need to concentrate hard over the last 100km and you don’t want to be exhausted.